A part of an instrument was found during the excavations of a shipyard at Fribrødre river on Falster, Denmark. It might have been part of a bagpipe, but there is no evidence to support this theory. 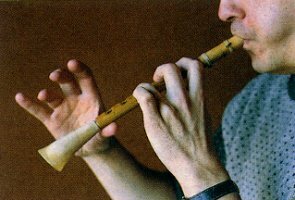 On the replica a wooden mouthpiece was added, making the instrument into a hornpipe (a kind of oboe). The find was from the later part of the 11th century.